From farm tool to desert racer, whether crawling over logs or flying over rocks with your Rhino, protecting the underside of the vehicle is critical. 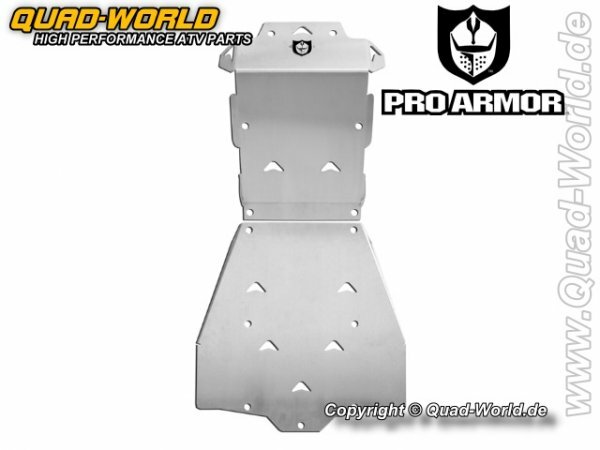 The Pro Armor Rhino Front Armor Set consists of the Front and Front-Mid Armor. Made from Aluminum Alloy this Armor uses the stock mounting bolts to make mounting a breeze. All pieces of Pro Armor Rhino Armor are engineered to overlap, providing your Rhino with MAXIMUM protection. Weiterführende Links zu "Pro Armor Front und Middle Unterfahrschutz für Yamaha Rhino"
Kundenbewertungen für "Pro Armor Front und Middle Unterfahrschutz für Yamaha Rhino"